The great baby sleep struggle. SIDS. Four capitals that trigger the hairs on my arms to quiver. Ever parents fear. Before your baby is even born there is an abundance of conflicting advice from healthcare professionals and other parents about safe sleep. Keep their little feet at the bottom of the cot, don’t include bumpers, keep baby on her back, make sure the room temperature is not too high, buy a new mattress. It made me sick with worry. My nan was told to place baby on their tummy and put them to self sooth in a separate room with only crib decorations for company. Recommendations change. Now, the Lullaby Trust promotes that healthy sleep for baby and parents, is in the same room for the first 6 months, knowing that the other is not far away. The controversy of co sleeping. When people warn against co-sleeping, they mean is bed-sharing. The danger of suffocation risks such as squishy pillows, thick duvets and heavy bodies. Oppositional sides are passionate in their opinions and I find myself lost somewhere in no man’s land. Apparently, it’s a very Western argument. It may be considered a weak answer but unless they are hanging their kids out the window at night, I would never belittle another mum or dad for their parenting choices. Personally, I had sofa fear when Norah was newborn as the risk of SIDS increases to 1 in 199 when co-sleeping on a sofa. It almost made me want to go set fire to DFS. When I was raising Leo solo I co slept with him from 18 months even though he made sounds like a farm at daybreak. My goodness, the kicking. And the elbows and knees in my back, face, chest, throat. Sleeping CLOSE to babies is natural. That said I have never trusted myself to sleep in the same bed with either of my babies when newborn. Pro co sleepers encourage the proximity which allows for immediate nursing and skin to skin– a highly important aspect of the parent-baby bonding experience. A safe middle ground solution for bedtime? Co-sleeping cots and bedside cribs are becoming increasingly popular in our newborn essentials. Norah arrived and did not sleep at night for 72 hours. Coming home from hospital she would not settle in her Moses basket even when swaddled. In desperation, we bought a Snuzpod. But – are co-sleeper cots really safe? They allow you to keep your baby close, while following safety guidelines. A separate sleeping surface, own bedding and a firm breathable mattress. Effectively, you’re lying next to your baby, but you’re not sharing bed coverings. A co sleeper will not be safe for a baby if you heighten risk factors of sharing a duvet or smoking around baby. Use sense. What are our top recommended side sleepers? There are a lot of bedside cribs on the market that can fulfil your needs, but before you buy it, you have to do your research. These are the products that we would buy. Chicco Next2Me or alternative Jane Bedside Crib. Tutti Bambini CoZee Bedside Crib. SnuzPod 3 in 1 Bedside Crib or alternative Knuma Huddle. There are also options like the Babybay Convertible bedside cot, but personally I do not like the rigid bar design as little hands tend to poke through. When you’re choosing a co-sleeper it is essential that you get one that’s adjustable to the same height as your bed, and that it actually fits alongside your bed: some are only designed to be fitted to bed frames, so if you’ve got a divan base, they won’t be compatible. Also consider the material. Wood may not be as cosy as a fabric sleeper, but it is easier to clean and aesthetically I prefer it. Our experience of the Snuzpod2 #Byyourside. The SnuzPod (pronounced ‘snooze’) is attractive, constructed from sturdy wood, the neutral design choice in a variety of colours will suit any nursery. It’s designed as a 3-in-1 solution, so it can be used as a standalone crib, Moses, as well as a three-walled bedside co-sleeper cotbed. It has adjustable height settings between 37 and 58cm and fits alongside any adult bed. It can be adjusted to seven different heights – but disappointingly, can’t be adjusted without disassembly. A versatile co-sleeper, it is practical too, with breathable mesh inserts for a safe and comfortable night’s sleep for your baby. The low storage shelf is perfect to store spare blankets. Norah loved this feature as she could see me through the panel. A negative could be that the side doesn’t block the light as well as some cots. I LOVED having the side down and easily being able to lift baby in and out without waking her with no awkward movements. The SnuzPod manufacturers recommend the mesh wall be zipped up as much as possible and not to leave your baby alone with the side panel zipped down. Dimensions: 100 x 42 x 95 cm | Weight: 18kg | Mattress: Yes | Max weight: 6 months | Height adjustable? : Yes | Stand-alone option: Yes | Can attach to Divan? : Yes | Rockable? It says so but in reality, if it is fixed to the bed, no. The easy-access zip sides were simple to use but I have seen a fair amount of feedback if not used carefully these can break. Its portability is incumbered by its heavy (18kg) frame, so I would not recommend it for travel or for lifting post birth! Also, the cotton fabric bassinet is hand wash only, so it can be a bit tricky to clean. Retailing at £199.95 they are mid-price, but I see no problem in buying one second-hand and buying a new mattress for £29. New it takes about 50 minutes to assemble, the main thing you need is space. Thankfully, you don’t need any screwdrivers. 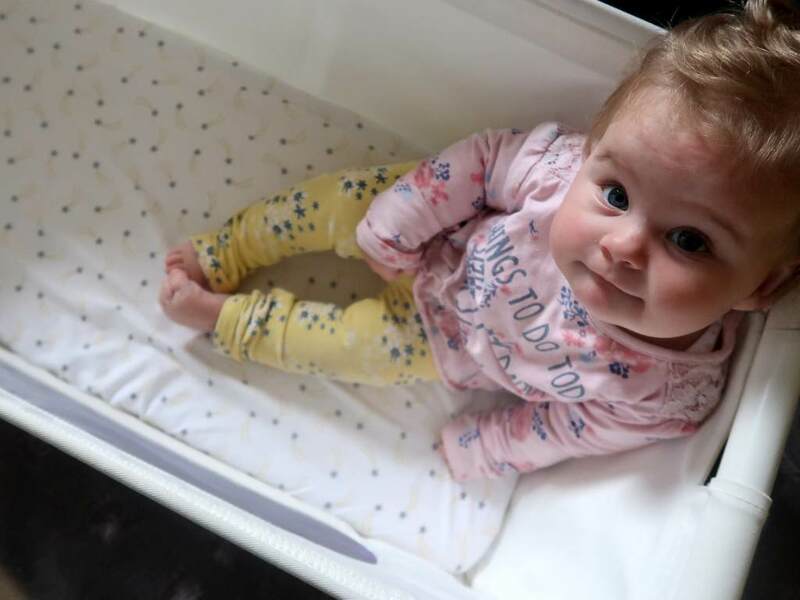 Like the Chicco Next2Me, Bednest and the Tutti Bambino CoZee, the new design SnuzPod 3 has an ‘incline’ option to reduce reflux, and constructed to weigh less too; so, parents can more easily move it around the house during the day to keep their baby napping close to them. What did your baby enjoy sleeping in or which type of crib have you chosen for your baby? Note: This is one of our own buys we wrote this post in the hope that it would help out other parents.